Charlie Brown and the Peanuts Gang are a childhood favorite of mine. I cant go certain holidays without watching some of the classics. 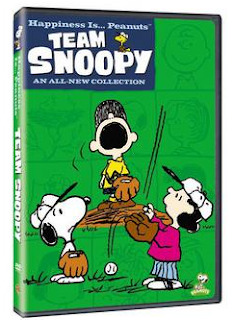 The newest DVD, Happiness is Peanuts Team Snoopy is great. My son has been into baseball lately. With his cousin JJ playing he sees pictures and we like to watch professional games on tv. He loves to hold a bat and have me pitch to him. He has not figured out how to use his glove correctly yet but oh my he can hit the ball like a mini pro. He loves the Team Snoopy DVD. We have been watching the movie this weekend a few times already. I know this is one he will ask for over and over since he likes Baseball. I like when Linus is playing in the outfielder with his blue blankie. Makes me think that might be how my little guy plays. He loves to carry around his own blue blankie. Peppermint Patty is always great too. I love how she calls Charlie "Chuck". Overall this is a great Peanuts movie to add to your collection. For Charlie Brown, a new baseball season equals new hopes of winning. Unfortunately, one player just isn't measuring up, which makes the team decide that Lucy Must Be Traded, Charlie Brown. Then suit up for a triple-header of laughs with The Charlie Brown and Snoopy Show. In The Pelicans, Charlie Brown gets stuck with mascot duties while Peppermint Patty is on the road to victory with her baseball team. Great Pumpkin finds the Peanuts gang visiting the bowling alley in hopes of teaching Charlie Brown a new sport with hilarious results, and it’s game on as the neighborhood cat meets his match when Snoopy’s older brother Spike trots into town. Happiness is Peanuts Team Snoopy is now out on DVD. You can own it on DVD by purchasing it from the WBShop.com or other retailers that carry DVDs. *Limited to US residents 18 years old and above. Giveaway starts May 6, 2012 and ends on May 18, 2012 at midnight PST. Winner will be emailed and has 48 hours to respond before another winner is selected. I was not paid for this giveaway or post. The opinions on this item are 100% mine and may vary from others. The sponsor is responsible for providing the prize. I like Lucy Van Pelt. I liked Frugal family tree on facebook. I liked Warner Bro.s fb page. I friended Popcorn and pearls on facebook.